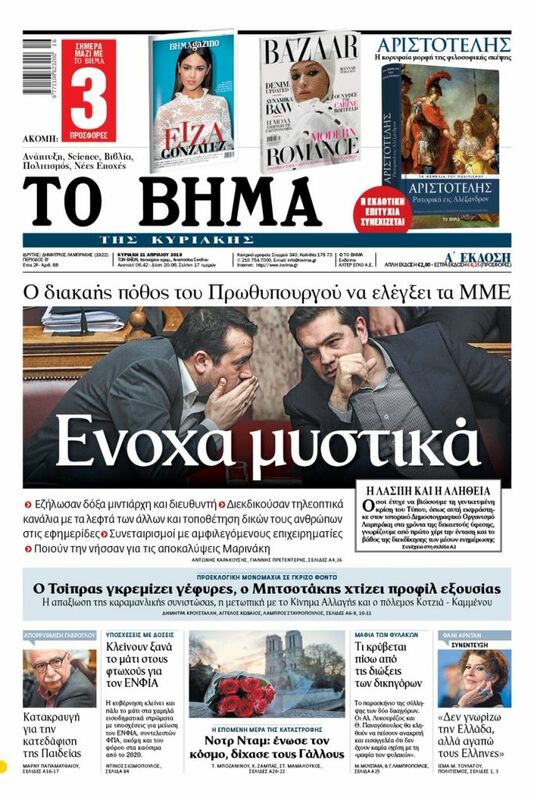 Noting that the understanding will allow the Church to gain a much greater degree of independence, Ieronymos profusely thanked the PM, asserting that if all is implemented as planned, he will go down in history as the leader who solved a problem that was intractable for decades. After Archbishop Ieronymos fired off a warning shot about PM Alexis Tsipras’ declaration that he will seek to establish “neutrality” in a planned revision of the Greek Constitution, the two leaders met this afternoon to iron out differences and agree on a roadmap for future relations. After the meeting, Tsipras announced a 15-point memorandum of understanding with the Church, which Ieronymos said that the Church hierarchy will likely approve.. The crucial points involve the salaries of clergymen and the exploitation of Church property. 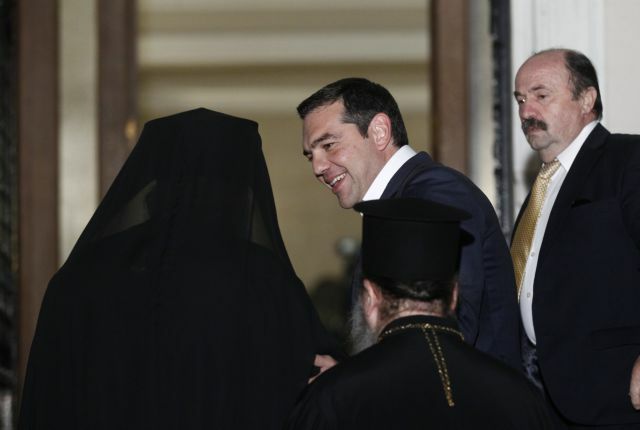 Tsipras said that the state will continue to pay the salaries of clergymen and lay employees as a subsidy, in accord with a 1939 agreement in which the state was given a huge amount of Church property in return for remuneration of a lesser value. In return the state later agreed to pay the clergy’s salaries. The state will continue to pay the clergy’s salaries (exactly the same total amount as today) as a subsidy, but they will no longer be civil servants, and the Church declares that it no longer has any demands arising from that property exchange. That means that on the books Greece will have10,000 fewer civil servants, in line with the previous demands of creditors for a paring back of the state. As for Church property, the two sides agreed that in line with a 2013 agreement, there will be a fund in which the Church will place property, the title of which has been disputed between Church and state from 1952 until today, as well as any other properties the Church will voluntarily place under the fund and exploit in cooperation with the state. It will be governed by a five member board, with two members appointed by the Church, two by the state, and one jointly. The revenues and obligations will be split 50-50. The agreement does not affect the huge land holdings of monasteries around Greece, over which the Church of Greece legally has no control. A bid by the Andreas Papandreou government to expropriate monastic land raised a political maelstrom and ended in failure, and the monasteries were later vindicated by the European Court for Human Rights. Monastic land is estimated at about 85,000 hectares, but the Church puts that figure at 130,000 hectares. The role of the Orthodox Church of Greece is enshrined in Article 3 of the Constitution, which SYRIZA has placed on a list of 23 articles to be amended. Before the meeting Ieronymos said he could live with the German model, which is based on both a separation of Church and State and a constructive cooperation. The salaries of clergymen are paid by those who declare themselves to be adherents of a certain religion through their taxes. He also left open the prospect of discussing all issues with the government, which would naturally include the state’s paying the salaries of Orthodox Church of Greece clergy and the use of Church’s vast property holdings. In the past, Ieronymos has bemoaned legal restriction and obstacles to the exploitation of that property. The Archbishop, accompanied by two Metropolitan bishops, had prepared a letter to the PM outlining the positions of the Church. In its proposals for the revision of the Constitution, SYRIZA says it seeks a “modernisation of Article 3 in order to strictly guarantee the religious neutrality of the state, while maintaining for historical reasons and as a statement of fact the recognition of the Orthodox Church as the prevailing religion”. The revised article would begin with a declaration that the Greek State is religiously neutral. The article would include an interpretive statement that the phrase “prevailing religion” does not constitute recognition of an official state religion, nor does it entail unfavourable repercussions at the expense of other religions. Before going to the PM’s Maximos Mansion office, Ieronymos convened a meeting of the 12-member Permament Holy Synod, the Church’s executive arm that handles day-to-day affairs when the full hierarchy is not in session, which discussed the amendment issue and what “neutrality may mean”. While declaring that he was not surprised by SYRIZA’s initiative, Ieronymos yesterday dropped a vitriolic barb regarding the vagueness of the ruling party’s proposal as regards the Church. “The ideal situation for us is for each side to be in its own house but work together so that all of us will be well,” Ieronymos said.